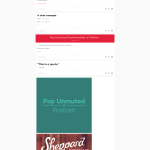 Pop Unmuted is a pop music podcast on which I act as a co-host along with host Scott Interrante. I created a logo that encapsulated the bright, expressive sound of pop music while also containing an air of sophistication and authority to match the podcast’s goals for intelligent, theory-based discussion of the genre. I also launched a Tumblr-powered website to house podcast episodes and related content. Using Tumblr’s default theme Optica as a base, I edited the theme to suit our branding ideas, including muted colors, the “-x-” design featured in the logo, and a web font that mimics the logo. Logo and social media images are .svg files to ensure clarity on tablets and smartphones.